Spider-Man 3 is an action game loosely based on the Spider-Man 3 film and released for the Game Boy Advance, Microsoft Windows, Xbox 360, PlayStation 2, Nintendo DS, Wii, PlayStation 3 on May 4, 2007. A PSP version was released on October 17, 2007. The Game Boy Advance, PlayStation 2, Nintendo DS & Wii versions were developed by Vicarious Visions while the Microsoft Windows version was developed by Beenox and the Xbox 360 and PlayStation 3 versions were developed by Treyarch. The game was planned for release on Xbox and GameCube. These releases were later cancelled due to low sales for Xbox and limited resources for GameCube. The game's plot expands on the film by including additional characters and elements from the Spider-Man comic books and the Marvel Universe. Depending on the platform, different villains from the comics are featured, but all versions of the game feature the film's main villains: New Goblin, Sandman, and Venom. A new gang called the H-Bombers have blown up the Carlyle building, and Spider-Man comes in to save the day. He beats the bombers and saves a woman from being killed. The next day, Peter Parker narrates: "Just another day in the life of your friendly neighborhood Spider-Man! Lately, things have been going my way. I got the girl and New York finally likes me. Not that there are problems, but there is this new guy Eddie Brock at the Daily Bugle, and he is really starting to get on my nerves. Harry, my best friend, won't talk to me. On top of that, new gangs have been dividing up the city, still its nothing I can handle. One weird thing, there hasn't been any big super villain around since Doc Ock. I had this bad feeling that the sky is gonna fall or something and soon." Spider-Man finds out that the H-Bombers aren't the only gang terrorising the city. He finds out that there are three other gangs in the city: The Apocalypse, the Arsenic Candy, and the Dragon Tails. However, he makes short work of the Apocalypse, who attacked the subway and the power plant, and the Arsenic Candy, who attacked a theater, a factory and an abandoned warehouse with hostages. The H-Bombers later attack the subway station too, but Spidey was able to stop them. Spider-Man takes Mary Jane Watson, his girlfriend, on a thrill ride, and stops by central park. Mary Jane asks how things been with Harry Osborn, and Peter responds that he has tried everything and Harry thinks he killed his Dad, Norman Osborn. Mary Jane tries to comfort him and tell him it wasn't his fault. Nearby, a symbiote inside a meteor crashes nearby and attaches to Peter's shoe. Meanwhile, Harry sneaks into the secret Goblin lair, and goes into a chamber filled with green smoke, and puts on his Goblin armor. Peter's college science teacher Dr. Connors, records a tape explaining that he has studied lizard DNA and that lizards can grow new limbs after they are accidentally cut off. So he decides to inject lizard DNA into him to grow a right arm (which he lost when he was in the U.S. army). The experiment turns out okay and Connors regrows his arm, but the experiment is far more than imagined and transforms into a giant lizard and knocks over the camera that he was using to record his investigation. Peter walks pass Dr. Connors' lab and hears strange noises coming from there. He finds out what happened and follows Connors into the sewers, where the Lizard already turned other people into lizards, too. Spider-Man then follows and defeats the Lizard but the Lizard escapes deeper into the sewers, and Spidey can't go any further. Peter changes into his clothes and worries until Harry (now the New Goblin) appears out of nowhere and attacks Peter. They go on a high-fly battle on New Goblin's glider, but Goblin is defeated and knocked unconscious by Peter's webbing, which he attached to a building. Peter brings Harry to a local hospital, where he will be treated. Meanwhile, an escaped convict Flint Marko tries to escape from the police and falls into a cockpit full of sand where scientists are mutating sand and Flint turns into sand. Spider-Man foils the H-Bombers plans once again, who were planting bombs all over Financial District. The H-Bombers decide to attack the Daily Bugle kidnaps J. Jonah Jameson. It was revealed that Luke Carlyle, one of the richest people in New York, was The Mad Bomber, the leader of the H-Bombers all along. Spidey foils the H-Bombers' plans and saves Jameson from The Mad Bomber. Spider-Man finds out about a science corporation called MechaBioCon, where a scientist named Dr Stillwell captured and tested * Scorpion/Mac Gargan who escaped his first encounter with Spider-Man in the subway station two years ago. Spider-Man goes to the city to chase and battle Scorpion in the city and then goes to sleep due to a very tiring day. During his sleep, the symbiote consumes Peter, leading Peter to have a new jet-black suit. The new symbiote suit makes him stronger, more agile, and more aggressive. Marko, now the Sandman, recently robbed a bank, and is headed for the subways. Spider-Man pursues him, and eventually defeats him, washing him away in a sewer line. Brock and Peter both are given an assignment by their boss, J. Jonah Jameson: catch Spider-Man robbing something, and the one who does gets a promotion. Brock attempts to cheat by paying someone to pose as Spider-Man. The real Spider-Man appears, now influenced by the black suit, breaks Brock's camera and punches him. Brock tells him that he has many more cameras, and automatically photographs Spider-Man punching him. Spider-Man is able to recover the cameras and Brock swears revenge. Peter gives Mary Jane a ride back to her apartment after a horrible date, where under the influence of the black suit, he alienates her. After acting too bossy and asking her to shut up, she decides to call off the relationship, which saddens Peter. Peter decides to go to a church, where he attempts to remove the symbiote suit, and successfully releases its bond to him. Unfortunately, Brock secretly finds and watches Peter unmask himself, and attaches to the symbiote, becoming Venom. Venom finds a still-alive Sandman, and blackmails him to work together to defeat Spider-Man, or he will kill Sandman's daughter, Penny. Sandman eventually agrees. They kidnap MJ, so Peter suits up again in the red suit as Spider-Man. He goes to the construction site where Venom and Sandman are holding MJ captive in a taxi. He fights Venom and Sandman while Harry, recovered from his head injury, decides to help Peter rescue MJ as the New Goblin. Harry arrives and rescues MJ, and fights a giant Sandman which he defeats. Harry attempts to help Spider-Man fight Venom, but is seemingly killed in the process. Peter eventually defeats Venom by weakening him with sonic vibrations then dropping the two of them off a building. He survives as Venom is impaled by a steel bar. Peter mends his relationship with MJ, and Sandman, still alive, is reunited with Penny, who has just been rescued by police. Note: these versions of the game contain a similar story to the next-gen versions of the game. Spider-Man spots a building on fire which a gang called the H-Bombers have blown up. Spidey defeats the bombers and rescues hostages inside the building. The next day, Peter Parker narrates "Just another day in the life of your friendly neighborhood Spider-Man! Lately, things have been going my way. I got the girl and New York finally likes me. Not that there are problems, but there is this new guy Eddie Brock at the Daily Bugle, and he is really starting to get on my nerves. Harry, my best friend won't talk to me. On top of that, new gangs have been dividing up the city. Still, its nothing I can't handle. One weird thing is that there hasn't been any big super villain around since Doc Ock. I had this bad feeling that the sky is gonna fall or something and soon..."
In this adaptation, many of the villains of the previous version are absent, but he fights Morbius and Shriek, who lead "The Waste Tribe" gang. He defeats Shriek by destroying an obelisk that helps her to control people of the city, defeats Morbius in a rooftop fight, and then defeats the two of them in a warehouse in their final battle. As Spider-Man swings through the air, he spots a building on fire. He enters it and defuses a bomb which has been planted there. He then finds New Goblin flying around, and defeats him, knowing that it is his friend, Harry Osborn. He then retreats to save civilians who are trapped in a building. After rescuing them, he is encountered by Sandman. Knowing that he cannot defeat Sandman, he flees to his home, where the alien symbiote takes over his body. Peter wakes up with the black suit, and uses it to his advantage. He then finds that Electro has kidnapped the Senator, and Mad Bomber has planted explosives throughout the city. After foiling their plans, and defeating them, he swings off to find Sandman, and gives chase. He then defeats Flint by opening a door which releases a large amount of water onto him. Spider-Man, thinking he killed Flint, tries to get the black suit off him, knowing that its influence is corrupting his mind. The black suit then is removed when sound waves drive it off, onto Eddie Brock, who desires revenge on Peter and Spider-Man, and gives himself the name "Venom". Spider-Man then finds that Sandman is still alive and well, and now has quicksand powers at his usage. He is then defeated once again by Peter. Venom then comes, and battles Spidey, but is defeated when dropped from the building. Spider-Man proceeds to call for medical attention, and the symbiote escapes into the night, with the screenshot saying "The End?". Levels 1, 2, and 3 begin with Spider-Man chasing the New Goblin around the city. The New Goblin throws bombs at Spider-Man and he has to shoot them with webs to make the bombs blow up. The glider can blow up if Spider-Man shoots webbing at it. Spidey wakes up with a black suit and fights the Sandman and his thugs. Spidey has to retrieve all the diamonds that Sandman stole and save people who are getting their backpacks stolen. (Levels 4-9). In Levels 10-12 Eddie Brock becomes Venom and teams up with the Sandman. They find a construction site and fight Spider-Man there. They kidnap Mary Jane and Spidey has to save her. This version of the game does not include any of the actors of the film of the other platforms. The plot changes drastically compared with the film and the other consoles, especially because none of the characters appear side of the other consoles, and this version follows a single thematic thread. As in most of the consoles, the player can return to any level using the Spider-Man's traditional suit or black suit. The game starts with Peter going to Mary Jane's play, but he is late for fighting some thugs on the streets. Mary Jane is disappointed to Peter by his double life as Spider-Man and asks him if he can be more like Harry. Then appears Harry Osborn, with the New Goblin costume to take revenge on Peter for the death of his father. Spider-Man defeats Harry and gets the symbiote. Possessed by the symbiote, Peter ruins the career of his fellow reporter Eddie Brock, defeats his former friend Harry, and almost kills Flint Marko. Realizing this, he decides to pull out the black suit, which falls into the hands of Eddie Brock, who becomes Venom. Venom kidnaps Mary Jane and decides to take revenge on Peter. Spider-Man defeats Venom, who promises that they will meet again, and rescues Mary Jane. Peter and Mary Jane finally get reconciled. The versions developed by Vicarious Visions retains many of what the Treyarch versions have. Most notably the recycled cutscenes and similar story missions, as well as the open-world hub and challenges. In the Wii and PS2 versions, the black suit can be put on at will and works similar to Hypermode in Metroid Prime 3: Corruption. although there is no health cost for using it. The black suit will enhance the player's attacks, but if the player uses it too long, Spider-Man can be permanently corrupted by the black suit, leading to a game over. To free Spider-Man from the black suit, the player must perform a series of quick-time events to turn him back to normal. Much like Spider-Man 2, you have an upgrade system, where you can purchase unlocked upgrades as you progress. Upgrades are purchased with Hero Points. You earn these points by completing the main story missions, or the side missions. The black suit cannot be upgraded. Like other Spider-Man titles, there are side missions that can appear at random. These missions can range from muggings to delivering items such as fruit pies. The side missions however are activated through a radio transmission which gives you the option of doing said mission or not. This has never been done in any Spider-Man game before. Much like the next-gen versions, there is a crime wave mechanic, where on the overhead map displays the gangs throughout the city. To lower the crime wave, you must complete combat tours where you have to complete tasks similar to the side missions of the game. As you progress the combat tours the gangs will lose control, giving the NYPD an advantage. If however, you ignore the combat tours the gangs will take over more parts of the city as well as other gangs. This will affect the open-world hub with a new environmental mechanic. Similar to Spider-Man 2 & Ultimate Spider-Man, there are collectables. The only collectables you can find however, are the Meteorites and Spider Emblems. These are scattered throughout the city. Spider Emblems can only be found once you complete the story missions. Once you find them all you will unlock the black suit. The primary features for the Wii version are motion controls. By flicking the Wii Remote & Nunchuck, you can perform various actions such as combat, and one of Spider-Man's trademark abilities: Web Swinging. There are also certain mini-games tailored to the motion controls. This can range from ridding a bomb, to completing quick time events. The PSP version is a full-on port of the PS2 version with an extra feature exclusive to the handheld known as "Conquest Mode". Conquest Mode is an extra mode where you have only a very limited amount of time to go around the city and complete challenges. These range from combat tours to delivering items to protecting civilians. The more challenges you complete, the more hero points you earn. Once the time is up you are given a score and you return to your last save. You can go back to it at any time to get a higher score. If you think you're done with Conquest Mode, you may go to the Daily Bugle to end it and return to your regular game. Conquest Mode can be accessed via the title screen or Scrapbook. A shot of Black-Suited Spider-Man by the alien symbiote. The Xbox 360, PlayStation 3 versions developed by Treyarch differ from the versions developed by Vicarious Visions. The most conspicuous difference is where you cannot alternate between suits at will, similar to how the Prince cannot control his transformation into the Dark Prince in The Prince of Persia: The Two Thrones/Rival Swords. Instead, you alternate between suits as you progress through the story. The upgrade system is different compared to earlier titles as well. Upgrades will be unlocked only as you progress and cannot be purchased. Collectables can be found in the form of tokens, which are scattered everywhere throughout the city, from skyscrapers to the subway tunnels. Once you have completed all the story missions, you are given a New Game + option. This will allow you to replay all the story missions in the black suit only. You can switch between suits via the pause menu. Spider-Man 3 is the first Spider-Man title to introduce quick-time events, a mechanic where you have to follow the corresponding controls on-screen to progress. Like many other PC games, the PC version can be modified, although very few mods for this game have been produced. Scorpion, Rhino, and Kingpin are exclusive villains to this version. The player can also grant an access to play as New Goblin on a second final part of the game for temporary, until the latter becomes a full playable exclusive to PlayStation 3's Collector Edition, then as downloadable content to both PlayStation Network and Xbox Live. In PC version's modifications, New Goblin's free roam gameplay is similar to his PlayStation Network/Xbox Live's downloadable content counterpart, such as having no story missions, except it has no challenge missions. Outside PC modifications, in all three versions, Peter Parker is also playable through a glitch, but some of your abilities are lost due to some of the glitch's bugs. However, you can overcome these bugs if you complete a certain side mission. The Nintendo DS version is a 2.5D side-scrolling beat-'em up game that uses the Touch Screen to execute most attacks. In this version, players can put on the black suit at will, and it can only help them. However, that suit will be disabled if Spider-Man's health is too low. This version supports wireless multiplayer. Special Editions of the game were available to PS2 and PS3 owners. 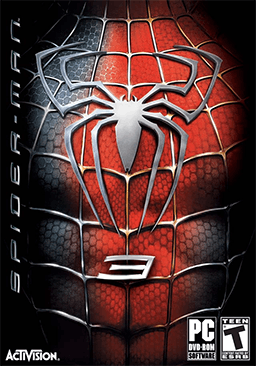 The PS3 Collector's Edition artwork shows the fully colored Black Costume of Spider-Man instead of a combination of both Spidey-Suits. Common features for the PS2 and PS3 were an interview with Avi Arad, chief creative officer of Marvel Entertainment and founder of Marvel Studios, Spider-Man 3 movie webisodes, a behind the scenes featurette with the cast, and a collectable lenticular card with the movie's images. The PS3 Collectors Edition came with a DLC which featured the ability to play as the New Goblin (Note: he will only be unlockable after you defeat him in the game.) The New Goblin DLC was later made available for download from Xbox Live and PlayStation Network users. Spider-Man 3 was met with mixed to average reviews. GameRankings and Metacritic gave it 63% and 68 out of 100 for the Game Boy Advance version; 78.17% and 79 out of 100 for the DS version; 62% and 53 out of 100 for the PlayStation 2 version; 53% and 60 out of 100 for the PC version; 66.24% and 63 out of 100 for the Xbox 360 version; 50.67% and 50 out of 100 for the Wii version; 63.03% and 62 out of 100 for the PlayStation 3 version; and 54.66% and 52 out of 100 for the PSP version. The key criticism for these versions is the game's similarity to its predecessor. The Wii, PS2, and PSP versions have been criticized for a short story mode and disappointing graphics, with GamesRadar suggesting that they were technically inferior to the preceding game from 2004. The Wii version has however been praised for the use of the Remote and Nunchuk in its gameplay, which is considered to be the Wii version's strongest point. The Xbox 360, PC and PS3 versions, despite receiving only average reviews, have been universally better received than the PS2, PSP, and Wii versions. The Wii version was given a "D+" grade by The Wire. X-Play gave the Wii version 1 out of 5 (the first Wii game to get 1 out of 5), the PS3 and Xbox 360 versions 3 out of 5, and the DS version 4 out of 5. The game was also criticized for not being the same version on each system. Some criticism has surfaced due to having New Goblin only fully playable in the PS3 and Xbox 360. It was also criticized for having a lot of glitches. However, Game Informer liked the PS3 and Xbox 360 versions of game, giving them an eight out of ten. For the DS version, GameSpot praised the number of moves, Tobey Maguire's voice acting, and the variety of missions, but criticized the soundtrack. ScrewAttack named the Wii version of the game the 7th worst superhero game. ↑ Treyarch developed the game for the Microsoft Windows, PlayStation 2 and Wii, Vicarious Visions developed the game for the PlayStation 2, PlayStation Portable, and the Nintendo platforms, and Beenox developed the game for the Microsoft Windows version. 1 2 "Spider-Man 3 for DS". GameRankings. Retrieved 2014-04-25. 1 2 "Spider-Man 3 for Xbox 360". GameRankings. Retrieved 2014-04-25. 1 2 "Spider-Man 3 for PlayStation 3". GameRankings. Retrieved 2014-04-25. 1 2 "Spider-Man 3 for Game Boy Advance". GameRankings. Retrieved 2014-04-25. 1 2 "Spider-Man 3 for PC". GameRankings. Retrieved 2014-04-25. 1 2 "Spider-Man 3 for Wii". GameRankings. Retrieved 2014-04-25. 1 2 "Spider-Man 3 for PlayStation 2". GameRankings. Retrieved 2014-04-25. 1 2 "Spider-Man 3 for PSP". GameRankings. Retrieved 2014-04-25. 1 2 "Spider-Man 3 Critic Reviews for DS". Metacritic. Retrieved 2014-04-25. 1 2 "Spider-Man 3 for Game Boy Advance Reviews". Metacritic. Retrieved 2014-04-25. 1 2 "Spider-Man 3 Critic Reviews for Xbox 360". Metacritic. Retrieved 2014-04-25. 1 2 "Spider-Man 3 Critic Reviews for PC". Metacritic. Retrieved 2014-04-25. 1 2 "Spider-Man 3 Critic Reviews for PlayStation 3". Metacritic. Retrieved 2014-04-25. 1 2 3 "Spider-Man 3 Critic Reviews for Wii". Metacritic. Retrieved 2014-04-25. 1 2 "Spider-Man 3 for PSP Reviews". Metacritic. Retrieved 2014-04-25. 1 2 "Spider-Man 3 Critic Reviews for PlayStation 2". Metacritic. Retrieved 2014-04-25. ↑ "Spider-Man 3 (X360)". Edge: 89. July 2007. ↑ EGM Staff (July 2007). "Spider-Man 3 (X360, PS3)". Electronic Gaming Monthly (217): 88. ↑ Reed, Kristan (2007-05-04). "Spider-Man 3: The Game (X360)". Eurogamer. Retrieved 2014-04-26. 1 2 Reiner, Andrew (July 2007). "Spider-Man 3 (PS3, X360)". Game Informer (171). Archived from the original on 2009-07-30. Retrieved 2014-04-25. ↑ Reeves, Ben (July 2007). "Spider-Man 3 (Wii)". Game Informer (171). Archived from the original on 2009-08-13. Retrieved 2014-04-25. ↑ This Old Man (2007-05-04). "Review: Spider-Man 3 (PS3, X360)". GamePro. Archived from the original on 2007-05-08. Retrieved 2014-04-26. ↑ This Old Man (2007-05-08). "Review: Spider-Man 3 (Wii)". GamePro. Archived from the original on 2007-05-13. Retrieved 2014-04-26. ↑ Damiano, Greg (2007-05-31). "Spider-Man 3 - Wii". Game Revolution. Archived from the original on 2007-06-06. Retrieved 2014-04-26. ↑ Damiano, Greg (2007-05-11). "Spider-Man 3 Review (X360, PS3)". Game Revolution. Retrieved 2014-04-26. 1 2 Provo, Frank (2007-05-11). "Spider-Man 3 Review (DS)". GameSpot. Retrieved 2014-04-25. ↑ Provo, Frank (2007-05-11). "Spider-Man 3 Review (GBA)". GameSpot. Retrieved 2014-04-25. ↑ Navarro, Alex (2007-05-04). "Spider-Man 3 Review (X360, PS3)". GameSpot. Retrieved 2014-04-25. ↑ Navarro, Alex (2007-05-09). "Spider-Man 3 Review (PC)". GameSpot. Retrieved 2014-04-25. ↑ Navarro, Alex (2007-05-07). "Spider-Man 3 Review (PS2)". GameSpot. Retrieved 2014-04-25. ↑ Navarro, Alex (2007-05-07). "Spider-Man 3 Review (Wii)". GameSpot. Retrieved 2014-04-25. ↑ Stratton, Bryan (2007-05-11). "GameSpy: Spider-Man 3 (NDS)". GameSpy. Retrieved 2014-04-25. ↑ Graziani, Gabe (2007-05-04). "GameSpy: Spider-Man 3". GameSpy. Retrieved 2014-04-25. ↑ Graziani, Gabe (2007-05-04). "GameSpy: Spider-Man 3 (PS3)". GameSpy. Retrieved 2014-04-25. ↑ Graziani, Gabe (2007-05-07). "GameSpy: Spider-Man 3 (PS2)". GameSpy. Retrieved 2014-04-25. ↑ Graziani, Gabe (2007-05-07). "GameSpy: Spider-Man 3 (Wii)". GameSpy. Retrieved 2014-04-25. ↑ "Spider-Man 3: The Game Review (X360, PS3)". GameTrailers. May 7, 2007. Retrieved 2014-04-25. ↑ "Spider-Man 3: The Game Review (Wii)". GameTrailers. May 21, 2007. Retrieved 2014-04-25. ↑ Boker, Gabe (2007-06-03). "Spider-Man 3 - NDS - Review". GameZone. Archived from the original on 2008-12-08. Retrieved 2014-04-25. ↑ Lafferty, Michael (2007-05-03). "Spider-Man 3 - PS3 - Review". GameZone. Archived from the original on 2009-03-03. Retrieved 2014-04-25. ↑ Bedigian, Louis (2007-05-13). "Spider-Man 3 - GBA - Review". GameZone. Archived from the original on 2009-02-20. Retrieved 2014-04-25. ↑ Hopper, Steven (2007-05-04). "Spider-Man 3 Review - Xbox 360". GameZone. Archived from the original on 2009-03-22. Retrieved 2014-04-25. ↑ Bedigian, Louis (2007-05-04). "Spider-Man 3 Review - Wii". GameZone. Archived from the original on 2009-02-19. Retrieved 2014-04-25. ↑ Smith, Brock (2007-05-30). "Spider-Man 3 Review - PC". GameZone. Archived from the original on 2009-02-19. Retrieved 2014-04-25. ↑ Sandoval, Angelina (2007-05-17). "Spider-Man 3 - PS2 - Review". GameZone. Archived from the original on 2008-10-05. Retrieved 2014-04-25. ↑ Harris, Craig (2007-05-04). "Spider-Man 3 Review (NDS)". IGN. Retrieved 2014-04-25. ↑ Shea, Cam (2007-05-04). "Spider-Man 3 AU Xbox 360 Review". IGN. Retrieved 2014-04-26. ↑ Miller, Greg (2007-05-04). "Spider-Man 3 Review (X360, PS3)". IGN. Retrieved 2014-04-25. ↑ Casamassina, Matt (2007-05-04). "Spider-Man 3 Review (Wii)". IGN. Retrieved 2014-04-25. ↑ Miller, Greg (2007-10-29). "Spider-Man 3 Review (PSP)". IGN. Retrieved 2014-04-25. ↑ Miller, Greg (2007-05-08). "Spider-Man 3 Review (PC)". IGN. Retrieved 2014-04-25. ↑ Miller, Greg (2007-05-04). "Spider-Man 3 Review (PS2)". IGN. Retrieved 2014-04-25. ↑ "Spider-Man 3 (DS, Wii)". Nintendo Power. 218: 95. July 2007. ↑ "Spider-Man 3". Official Xbox Magazine: 80. July 2007. ↑ "Spider-Man 3". PC Gamer: 70. August 2007. ↑ Ruberg, Bonnie (2007-05-28). "Spider-Man 3 (Wii)". The A.V. Club. Archived from the original on 2007-05-28. Retrieved 2014-04-26. ↑ Hill, Jason (2007-05-17). "Spider-Man 3 (Xbox 360, PS3)". The Sydney Morning Herald. Retrieved 2014-04-26. ↑ Elston, Brett (2007). "Spider-Man 3 (PS2, Wii; incomplete review)". GamesRadar. Archived from the original on 2007-05-14. Retrieved 2014-04-25. ↑ D'Aprile, Jason (2007-06-11). "Spider-Man 3 (PS3, Xbox 360)". X-Play. Retrieved 2014-04-25. ↑ D'Aprile, Jason (2007-06-11). "Spider-Man 3 (DS)". X-Play. Archived from the original on 2008-11-22. Retrieved 2014-04-25.